Starting a home based candle making business is not that difficult provided you know what you are doing. Candle making is one of the simplest most lucrative craft market niches that you can work your way into. It just takes a little practice. Everybody loves candles, and most folks burn them. Therefore, this type of craft will usually be in high demand. Furthermore, some folks like to collect specialty candles, which they use for decorating during special occasions or holidays. It is easy to make candles, and you can make and sell several different types. Before starting a home based candle making business, it is best to decide from the outset, what type of candles you are going to make. Start with one or two products that you are comfortable making. Scented container candles are the easiest to make and you can expand the line by using different scents. You will also need to research where to get bulk supplies of candle wax, wicks, dyes and scented oils. Many customers enjoy buying scented candles to help keep their houses smelling nice. They will put them in nearly every place in their home including the bathroom, kitchen, dining room, bedroom, and living room. Some may even put them in the garage. They are typically made from either paraffin wax or beeswax. The paraffin is what is used in most molded candles, although beeswax can also be used. Because beeswax is more pliable, it is often used in rolled candles because no melting is required. You can purchase certain liquid scents, which you would mix with wax, and pour that complete mixture into a jar or other candle mold. You can also add certain types of household spices such as cinnamon, cloves, tea leaves, or dried flower petals to your candle mixture. Candle scents can be purchased in craft stores, or you could add certain types of burnable scented oils. One of the most complicated parts about when pouring your candles is to make sure you do not lose the wick in the wax. The easiest way to achieve this is to tie the top end of the wick to a pencil, toothpick, or other stick long enough to sit over the mold case. After you tie the top end of the candlewick to the stick, you then dip the bottom end of the wick into the newly poured liquid. Make sure you act quickly because candle wax dries fast. In order to make sure you add the candlewicks in time you may want to prep them before pouring the wax. Another method of candle making, which does not involve any melting, is using beeswax. You can actually roll the wax around the wick which can easily be centered. Using beeswax, you will be able to make large quantities of candles quickly. Beeswax can still be melted and used to make molded candles if you want to use it that way.. There are numerous other methods of shaping and molding your candles to create collectible masterpieces as well. To make commemorative holiday, birthday, anniversary, and wedding candles, you can use a variety of materials such as glitter ribbons and even paint. If it is a Christmas candle, you can add real or fake balsam or holly branches to the base, or just a red bow. You can be creative as to what you use for a mold as well. For instance, you can use unbreakable glass pieces, which you can purchase at a thrift store or yard sale. In some cases, you may be able to use tin cans. In fact, any material that will not burn or melt easily is excellent to use as a mold. 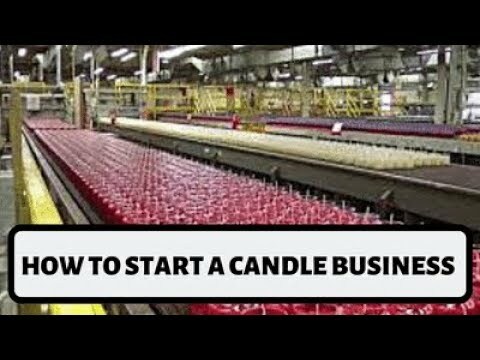 You can start out by making and selling simple candles, and expanding your inventory as you learn more about candle making techniques. There are endless ways to shape and decorate your candles. If you need ideas, you can look in craft books for help.